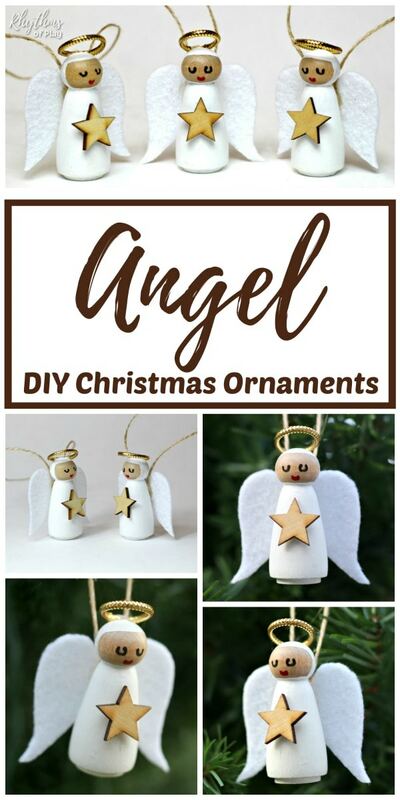 DIY Angel Ornaments made out of wooden peg dolls are a fun Christmas craft kids and adults can make. 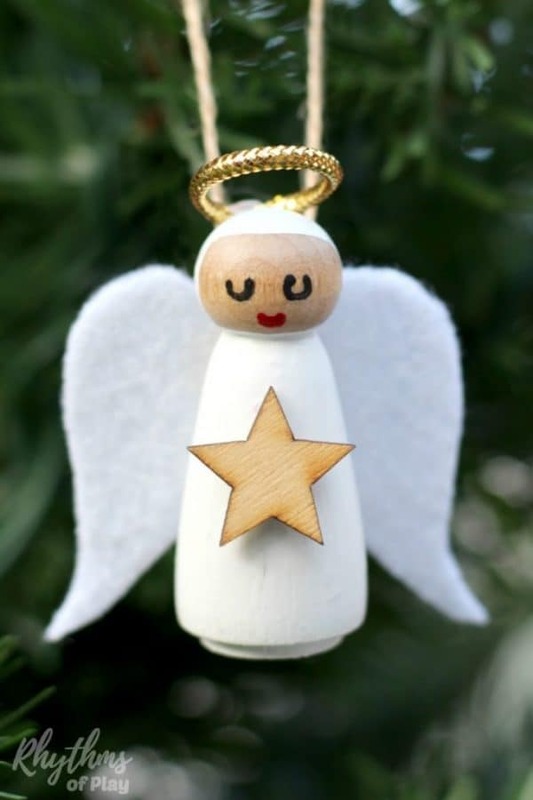 Wooden angel ornaments for Christmas tree. Make homemade angel Christmas ornaments with your children today! 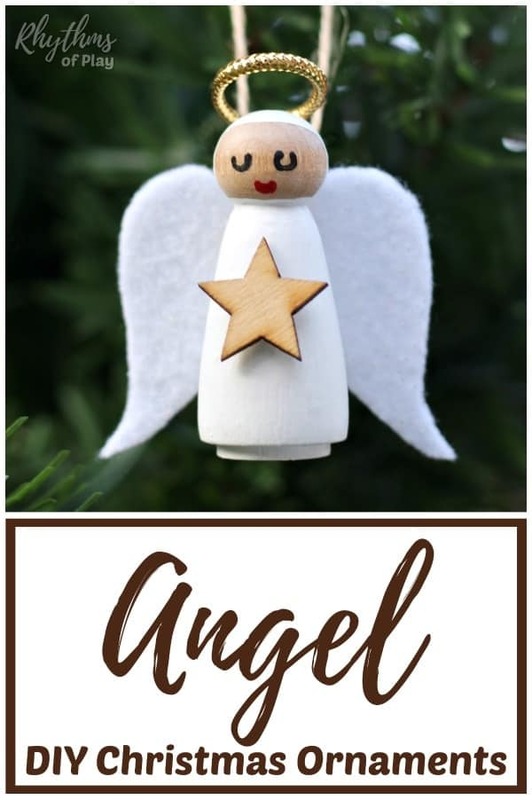 Read through the directions to make Angel Ornaments before starting to make this Christmas craft. The step by step Angel Christmas Ornaments DIY photo tutorial can be found below the written directions. My daughter loves to make Christmas ornaments with me. I tape the heads of the wooden peg dolls with painters tape so my daughter can easily help me paint the body of the angel ornaments. 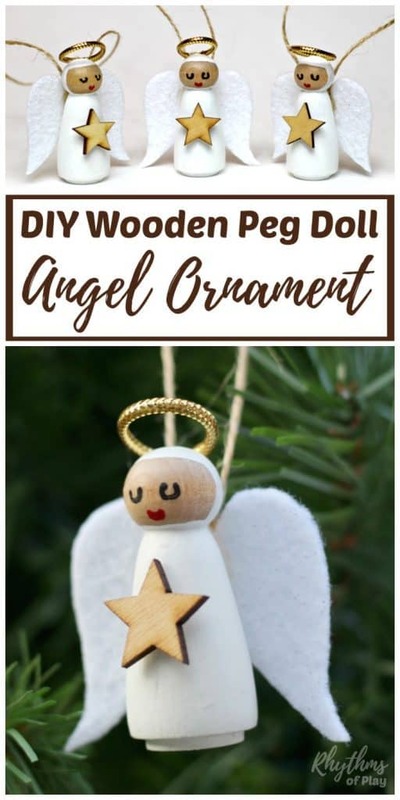 You can see a photo of how she likes to stick the taped head into a wooden peg doll stand so it is easy for her to hold and paint in the DIY angel ornaments photo tutorial below. They also make great drying stands! We have also made wooden Elf Ornaments with peg dolls from the same set… Click on the link to see them! To paint the heads we used the same technique that we used to make Wooden Peg Doll Fall Fairies. Click on the link for directions and a photo tutorial. We have also made winter fairy peg dolls using the same technique. Dip an Incredible Nib into black or brown acrylic paint to make the eyes, or use a black or brown extra fine tip paint pen . For a photo tutorial with the hack, I use to easily create “U” shaped eyes pop over to have a look at Wooden Peg Doll Fall Fairies. To make the angels mouth, dip an Incredible Nib into cherry red acrylic paint or use an extra fine tip red paint pen to make three dots in the shape of a heart. Use a foam brush to paint Mod Podge onto the wooden peg dolls to seal and protect them before moving on to the next step. Don’t use a regular paint brush to do this unless you don’t mind throwing it away when you are finished. Mod Podge is a glue sealant and can ruin them. Print the angel wing template out on cardstock. Cardstock creates a stiff template that can easily be traced over and over again. Cut the angel wing template out. Trace the template using a pen with disappearing ink onto the white glimmer felt . You will need to trace one for each angel ornament that you will be making. Disappearing ink will automatically disappear from the felt in 24 – 48 hours. It can also be washed off. Using disappearing ink will ensure that you do not have an ugly trace line visible along the edge of the angel wings. We’ve tested it to work perfectly on felt–even white! Cutting felt is tough. We recommend using sewing scissors to make it easier. It is hard to cut the scalloped edges of the wings so we ended up tracing and cutting a straighter edge on the inside of the angel wings that looks just as beautiful that you can see in the angel Christmas ornament DIY photo tutorial below. Note: You will be using a glue gun for the next few steps. Read through the next few steps and make sure you have everything you need to complete DIY angel Ornaments ready to go standing by. For this step, you will need 6-10 inches of jute twine and one pair of wings for each ornament. Make a loop with the twine and glue the twine, wings, and wooden peg doll together as shown in the photos below. 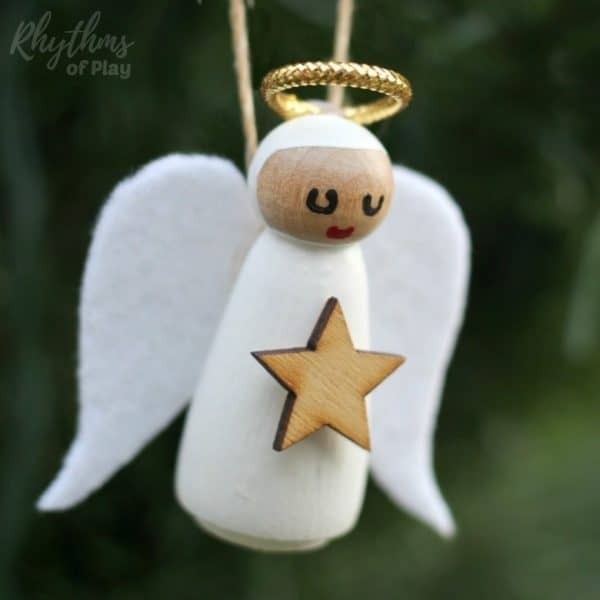 You will need just under 2 inches of gold cord for each wooden peg doll angel ornament. Use a glue gun to place a dab of glue on one end of the gold cord and quickly place the other end into the glue to attach it. 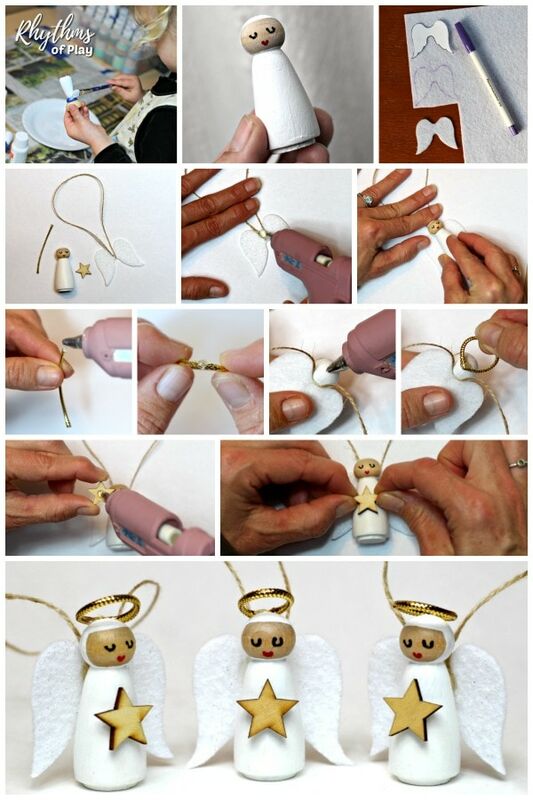 Place a dab of glue on the back of the wooden angel ornaments head and attach the halo. You want to tip the each angles halo up slightly. Don’t worry, it’s super easy and they will hold. Step 8 – Glue Wooden Star to DIY Angel Ornaments. Place a dab of glue on the back of a wooden star. Attach it to the front of the wooden peg doll angel ornament. 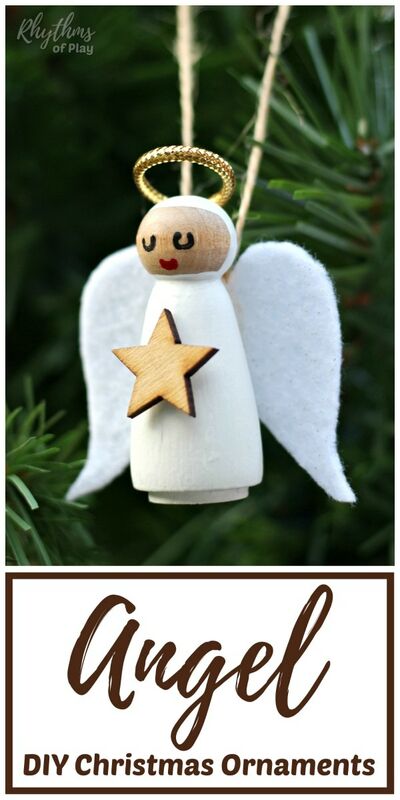 DIY wooden angel Christmas ornaments make beautiful handmade holiday decorations. My daughter and I are thrilled with how gorgeous they look flying on our Christmas tree! We hung them on our tree near our Walnut Shell Manger Ornaments so that the angle ornaments fly above baby Jesus. They look absolutely darling together! Don’t forget to check out our gift guide with DIY and ready-made ideas for the whole family! You may also like this awesome collection of homemade gifts kids can make and fun family Christmas traditions for a Magical holiday season. The set of wooden peg dolls needed to make DIY angel Christmas ornaments includes enough peg Dolls to make a few more wooden Christmas crafts and wooden doll DIY toys for children. Try any of the peg doll craft ideas below!